Trout need clean, cold water to survive. And thanks to many Iowa farmers who are taking on the challenge to improve water quality, the fish are getting just what they need in northeast Iowa. Farmers and landowners are improving the trout habitat with watershed and land use improvement projects that control erosion and reduce the amount of sediment in the water. That’s good news for the fish, anglers and local economies in Iowa’s Driftless region, where annual spending on fishing and tourism is estimated at $20 million. The recovery of Iowa’s trout streams has been remarkable. In 1980, only six streams in Iowa could sustain a trout population without stocking, according to the Iowa Department of Natural Resources (DNR). By 2007, that number grew to 32 streams, and today, trout reproduce naturally in 45 Iowa streams, thanks to improvements made by farmers and others, the DNR said. A clear example of farmers’ efforts is Silver Creek in Howard and Winneshiek counties. 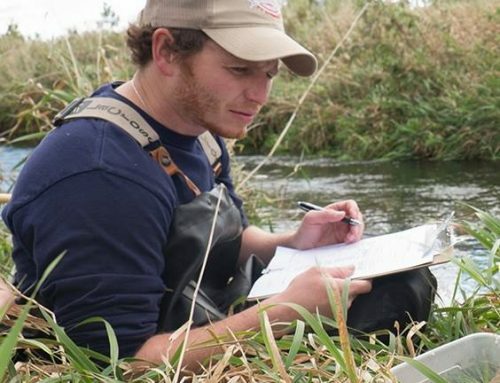 Neil Shaffer, a Howard County Farm Bureau leader and watershed coordinator with the Howard County Soil and Water Conservation District (SWCD), is leading the Silver Creek Water Quality Project. He is working with committed partners, including Howard SWCD in cooperation with Winneshiek SWCD, the Iowa Department of Natural Resources (DNR), the Natural Resources Conservation Service (NRCS), the Iowa Department of Agriculture and Land Stewardship, the U.S. Environmental Protection Agency (EPA) and Trout Unlimited. The key to the stream restoration project, Shaffer said, has been the work by local farmers. “Our ultimate goal is to get trout back into the streams,” said Shaffer. But, he said, to improve a trout stream, it’s important to focus on the entire watershed, including land miles away from the stream. 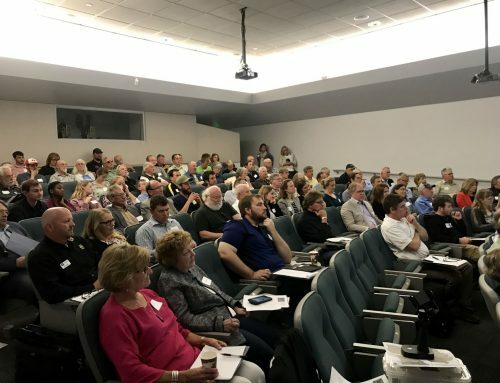 That means increasing the acreage in cover crops, no-till practices, buffers, pollinator habitats, grass waterways, terraces and wetlands, Shaffer said. “Five years ago, no one was doing cover crops up here,” noted Shaffer. “Now we have 118 different operators and landowners participating in various practices. We really took off running,” he added. The Silver Creek restoration project also includes a number of other conservation practices, including planting grassed waterways, building manure control structures, improving grazing systems, building terraces and creating wetlands. Shaffer said being a farmer himself and an Iowa Farm Bureau member for 26 years gives him an advantage when he works with farmers. One of those cooperators is Brandon Reis, who farms with his father northwest of Cresco. Teaming up with Shaffer to improve Silver Creek seemed like a natural step to Reis. The family has been no-tilling for more than 20 years and started planting cover crops in 2013 when Brandon, an Iowa State University graduate, returned to farming after working with an engineering firm. “Every year we’ve done more than the previous year,” said Reis. “What we found with cover crops is that the benefits far outweigh just soil protection. There’s a crop health and yield component to it that we’re just starting to understand,” he added. Along with no-till and cover crops, Reis started in 2013 to restore stream banks, extend buffer strips and create wetlands. All of the practices help improve the quality of the water flowing into Silver Creek. The farmers’ work has paid off. Shaffer said water sampling between 2011 and 2016 has measured a continual drop in bacteria levels. “I can’t think that drop has not been impacted by the practices we’ve been doing out there,” said Shaffer. The DNR and federal agencies require specific criteria before stocking a stream, and Shaffer says and Silver Creek is making the grade. The quality and the temperature of the water has improved so much that this year it met the criteria for a fish release. 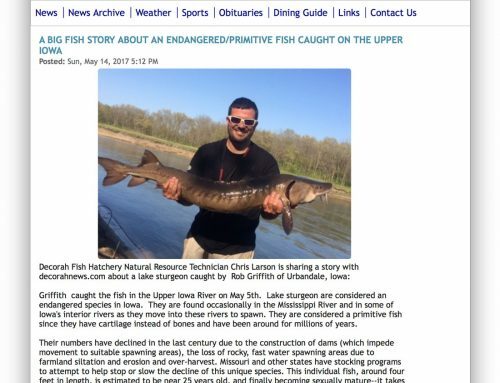 “The bacteria levels have fallen, and it has passed the cold-water stream criteria,” Shaffer said. Last week, the DNR released 700 fingerling brown trout into Mullen Creek, which is part of the Silver Creek project. Brown trout, Shaffer explained, need the coldest and highest quality water. The plan is to release another 700 fingerlings in the spring of 2018 and then survey the creek in 2019 to see how the fish are doing in the restored creeks, Shaffer said. 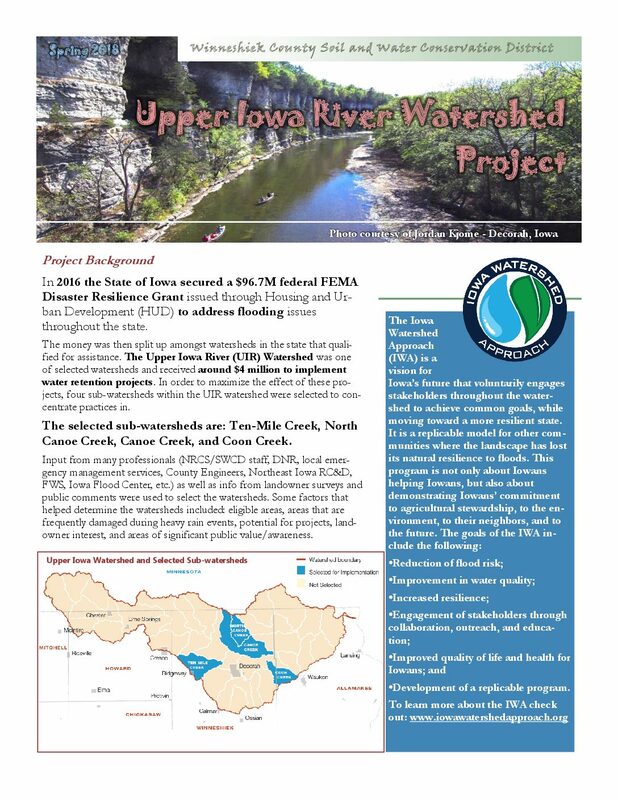 The Silver Creek water quality project is one of a number of efforts that is improving water quality, aiding trout habitat and attracting more anglers to northeast Iowa, according to Michael Steuck, DNR fisheries supervisor. Iowa trout stamp sales for both residents and non-residents hit an all-time high in 2015, at 45,472 licenses sold. That promises great fishing in cold, clean streams for even more Iowa anglers.